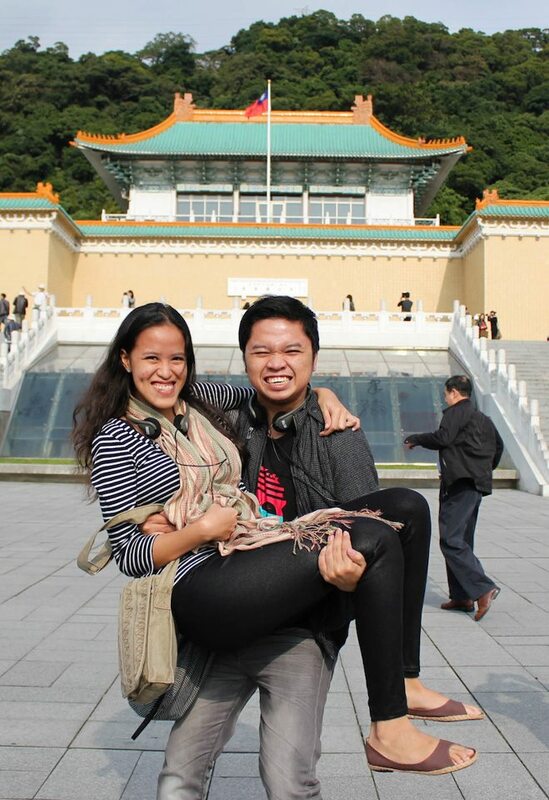 When I received the invitation to join AirAsiaGo’s Taipei City Tour, I immediately informed my grandfather about it. He mentioned that I must not miss the opportunity to visit the ‘museum of Chinese treasures’. I have to admit that I didn’t really check the whereabouts of the places we’re scheduled to visit for the whole trip. Let’s just say that I worry less when I know I am not in-charge of the itinerary or anything else. Taipei City Tour Day 1!! Â We enjoyed our full breakfast at Yammy Cafe, the in-house food establishment of FX Hotel. At 9am, we saw our tour guide Johnny waiting for us at the lobby area. Let the city tour begin! While at the bus, Johnny reminded us that Taiwanese people are always on time and that we should stick to our schedule. No wonder Taiwan is considered as one of the Four Asian Tigers. Use your time wisely! It’s a sunny day and we’re eager to go out and play! 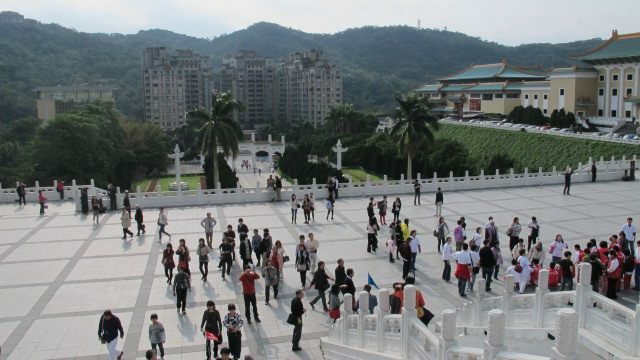 The first destination for the day is the National Palace Museum. We were also introduced to Cerbrina, a pretty Taiwanese lady who studied in the USA. She is one of our tour guides for the day together with Johnny and Luna. She shared some important information about the National Palace Museum. At the same time, a travel video is being played inside the bus. Keep calm and carry me! Johnny reminded us that we’re not allowed to take pictures inside the art gallery so I left my camera at the bus. I’m glad that the rest brought their cameras with them. At least we were able to use them for take outdoor souvenir pictures. I love the fact that I am exploring an Asian city on a sunny day, yet Â not humid. Love it! We were given a go-signal by Johnny to follow him to the art gallery. It’s a Monday morning and visitors from Mainland China from different age brackets were waiting too. Isn’t it ironic that some of the ‘Chinese treasures’ are in Taipei now, and people from Mainland China are lining up for the opportunity to take a sneak peak? It reminds me of some of the original treasures of Egypt that are currently on display at The British Museum (uh oh. Another backlog to work on 0_o). I’ve heard of Chiang Kai-shek and Mao Ze Dong way back in high school, and it all makes sense now. I’ve also read about the surreal Chinese art creations from the past. 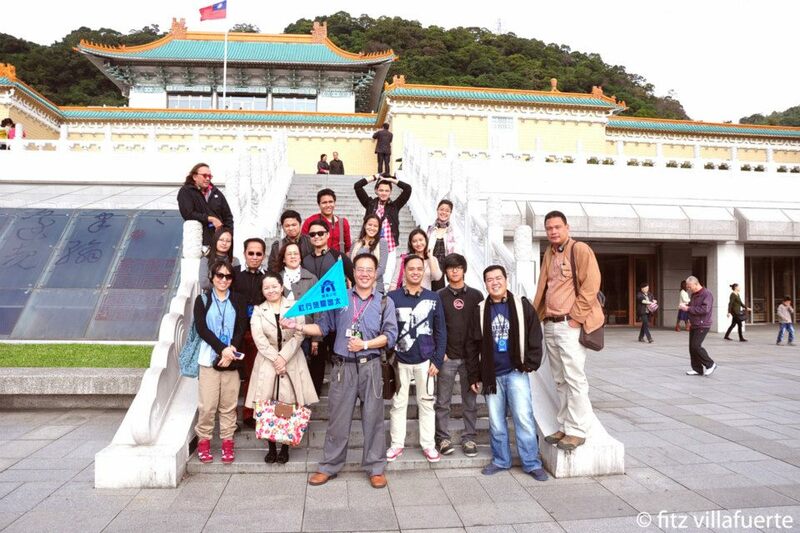 No doubt the National Palace Museum of Taipei is one of the most visited museums in the world. While waiting for our turn, our tour guides pointed the poster of The Carved Olive Boat. What is so special about it? 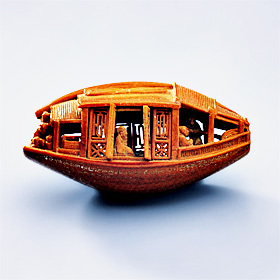 Well, it is a small-carved boatâ€¦ as small as a walnut, honey. It was engraved by hand sometime in the 17th century. I was amused when I saw the real thing. It is so small, yet the creator of this masterpiece was able to showcase different expressions of the boat passengers! Now I know why there’s a magnifying glass around it. At the bottom part, you’ll see 300 Chinese characters carved. 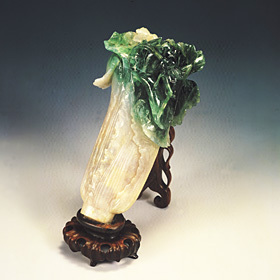 There’s also The Jadeite Cabbage, or â€˜Maharlikang Pechay’ as I want to call it 😛 From the Qing Dynasty, it is arguably one of the most popular piece in the museum. It embodies a perfect three-in-one union of intrinsic nature, human creativity, and symbolic significance. When you look closely, you will see a cricket. It is said to symbolize purity and fertility. This piece was a gift to the emperor. There are more interesting pieces in the museum. Too bad we were only given a few hours to stay in the place. Every section surprised us. My favorite section though is the Ivory and Rhinoceros Horn carvings. You will also find a number of rare books, calligraphy, paintings and many, many more! I am overwhelmed with so many unbelievable carvings. So many sections to visit, so little time! We need a drink! We were able to stay a bit at Xianjufu CafÃ© to quench our thirst. I ordered Bubble Milk Tea. I mentioned that I got overwhelmed with the number of treasures on display, right? I forgot to share that not all of the treasures transferred to Taipei are on display when we went there. What we saw is only a portion (uhm, 1-5%?) of the complete collection. Over 3,000 pieces are displayed at the main museum every three months. It will take 100 years (or more) before all the pieces will be shown publicly. The other artifacts are safely kept in a protected vault at the mountain behind the museum. Imagine that! I am thankful that these artifacts were saved and preserved. These are reminders of how our ancestors were in the past. We’re lucky because we’re currently living in a world where tasks can be accomplished easily. 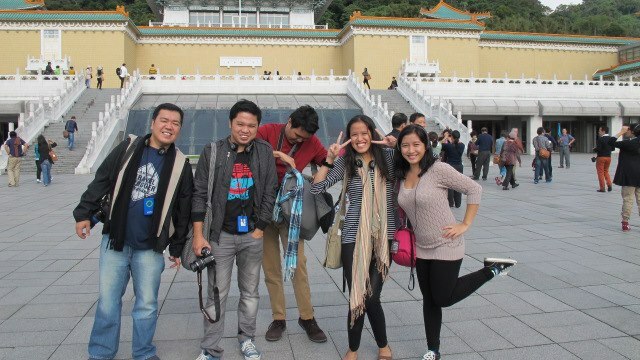 Photo credits: National Palace Museum, Kevin, Fitz and Yoshke. Special thanks to AirAsiaGo Philippines for making this trip possible! For tours and hotel bookings, just visit the AirAsiaGo Philippines website. Add them on Facebook and Follow them on Twitter! to be fair, Taiwan is where the Republic of China, the first modern government of China, retreated when they were defeated by the communist party, which then established the currently governing People’s Republic of China. Happy New Year badet! Hehe kaaliw yun. Nabilib talaga ako sa kung sino man ang gumawa nun hehe ang tiyaga! sobrang na inggit ako sa byahe na to kasi dapat diyan ako sa Feb 2013 kaya lang wala daw pala snow this year. kaya masaya na ako makita ang taiwan sa mga posts mo.